In this, P wave indicates the impulse of contraction generated by S.A. node. QRS wave indicates the spread of impulse of contraction from A.V. 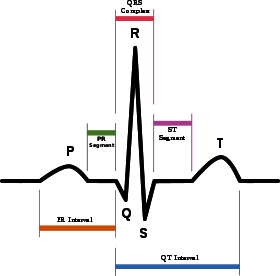 node to the wall of ventricles, whereas the T wave represents the relaxation of ventricles. Any abnormality in the working of the heart changes the wave pattern of ECG and can be interpreted by a trained physician to diagnose a particular disorder. The technique to detect the abnormalities of the heart with the help of ECG is called electrocardiography. Such patients should never be exposed to MRI tests. MRI test adversely affects the process of pulse generation. He should not pass out through a metal detector or airport security. 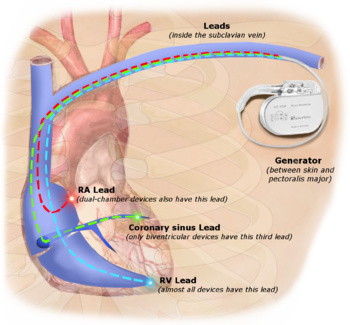 Powerful radio waves, cell phone, radar, microwave oven and other electronic instruments also affect the functioning of the artificial pacemaker. Due to the continuous flow of blood, a pressure is exerted on the wall of blood vessels. This pressure is known as blood pressure (B.P.). The instrument used to measure B.P. is known as the sphygmomanometer. 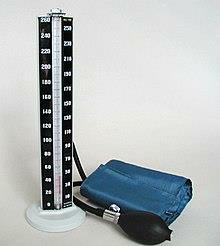 Sphygmomanometer was discovered by Scipione Riva Rocci in 1896. The instrument actually measures the atmospheric pressure which is equal to the pressure of blood in arteries. The instrument has a rubber pocket (cuff) in which air is pumped. It can be rapped over the arm. The pocket is connected with a rubber bulb through a tube. Another tube connects the pocket with a mercury column fixed with a meter scale which is movable. When the B.P. of a person is to be measured, the rubber pocket is rapped over the arm of the person so that it remains over the brachial artery. Air is now pumped into the pocket with the help of bulb. Due to increase in the air pressure the level of mercury in the column rises which can easily be seen on the meter scale. Pumping of air is continued till the pressure of mercury becomes higher than the person's B.P. Now the stethoscope is put over the brachial artery and heartbeat is observed. Due to high pressure in mercury column, the sound of the pulse is not heard. The air pressure in the apparatus is released slowly by opening the knob at the bulb. The pulse sound is regularly heard. With gradual decrease in air pressure, a situation prevails when the blood pressure and air pressure in mercury column become equal. In this situation, the sound of the heartbeat is clearly heard by ears. Ite denotes systolic pressure in arteries. With the further decrease in air pressure, the sound gradually becomes louder. But if the decrease in air pressure is continued, the sound of heartbeat diminishes slowly and ultimately hearing of sound stops. The pressure in mercury column at this point denotes the diastolic pressure of blood in arteries. If the systolic and diastolic pressure of a person is 120 and 80 mm, respectively, his / her blood pressure is represented as 120/80. You thus now know all about the three medical instruments - ECG, pacemaker and sphygmomanometer - which are related to the heart. Blood pressure is a killer disease all over the world. Blood pressure kills a person with in few hours, if the treatment is delayed. Some times, Due to blood pressure sudden heart attack leads to death. In this article, the causes, symptoms and risks of blood pressure are listed to create awareness about the killer disease. How To Control Low Blood Pressure? Generally people don’t take hypertension (low pressure) seriously. They have many misconceptions also on this count in their . But when not treated well on time, low blood pressure can give invitations to several disorders. Hence it is necessary to keep the low blood pressure under the leash. This article tells you how blood pressure can be controlled. Blood pressure is one reveals the speed of the pumping/flowing of the blood to our heart. Normally we used to say,"I am having Blood Pressure". In the real sense, everybody has Blood Pressure, only because of the blood pressure we lives. But actually the problem arises when the pressure of blood is vary. Blood pressure should be normal and it should not fast or slow. If it is fast, the High BP and if it is slow, Low BP can be said. We can see about the variation of BP.